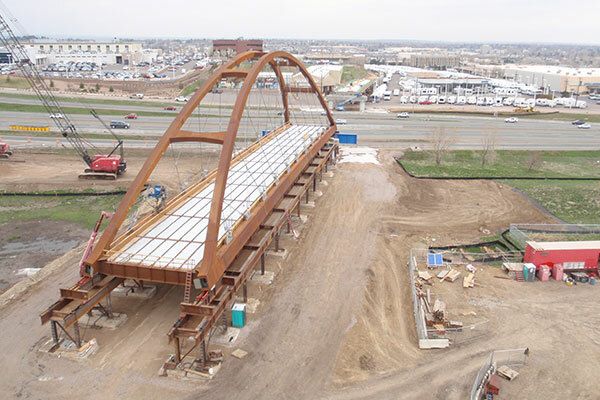 Kraemer was the major bridge subcontractor providing both CMGC preconstruction and construction services to Denver Transit Construction Group (DTCG) for the Regional Transportation District’s (RTD) FasTracks West Corridor CMGC project. Kraemer successfully completed eight bridges along RTD’s West Corridor Line running from Denver to Golden, CO. To address unique project challenges and objectives, various complex bridge types were constructed including a tied arch ABC (a combined SPMT and roll-in) over 6th Avenue, haunched precast post-tensioned girders, combination of CIP post tensioned and steel plate girders, curved steel plate girders over UPRR and BNSF, and a complex structural steel truss over the South Platte River. Kraemer initiated long lead time material procurement on structural steel elements and early release for construction packages, offering a valuable reduction in cost and risk.